There are quite a few Scandinavian bands who have dabbled in jazz and Pop/Rock with a great level success...Efterklang, Jaga Jazzist, and Notwist at the head of the pack. 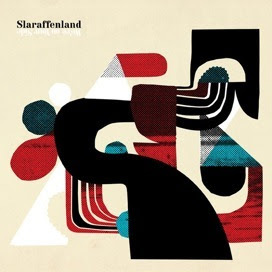 Slaraffenland are a 5 piece from Denmark who sound more like a band with 20 members which I suppose has something to do with the fullness a few horns and choral / group singing style can add to song. I get why this group gets compared to Arcade Fire, A Silver Mt Zion, and Akron Family but I think many music writers struggle to describe a band's style either because their reference point is limited or perhaps they think their reader's would prefer a dumbed down description of band. Don't let the lazy comparisons scare you away. The band carries their own unique knit of playful Pop with experimental music for beginners and while the sound might be vaguely familiar, you will never be able to guess where each song on We're on Your Side will take you next. And for those of you who care about quality packaging and extraordinary album artwork, this record makes my top 10 on the cover art alone.